Researchers in India recently published a study in the journal Fertility and Sterility supporting D-Loop genotyping to predict risk of endometriosis. The study included 302 women – 152 participants were diagnosed with endometriosis (verified by transvaginal ultrasound and laparoscopy) and 150 women without endometriosis. Blood samples collected from both groups were analyzed using polymerase chain reaction sequencing to include the D-Loop. Novel mutations and polymorphisms were reported in both groups, but alterations in the D-Loop were more prominent in patients with endometriosis than the control group. 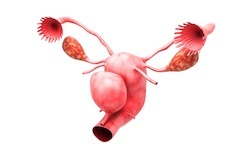 Researchers believe D-Loop genotyping may be a good tool for predicting future risk of endometriosis. Additional long-term study is needed to identify real life accuracy between D-loop mutations and polymorphisms and endometriosis diagnosis. No future research plans were mentioned in the study. Source: Govatati S, Deenadayal M, Shivaji S, Bhanoori M. Mitochondrial displacement loop alterations are associated with endometriosis. Fertil Steril. 2013 Mar 8. pii: S0015-0282(13)00278-1. doi: 10.1016/j.fertnstert.2013.02.021.